If you’re not practicing customer segmentation in 2019, your business is in trouble. Today’s consumers expect some level of personalization in their marketing – if they aren’t getting it from you, they’ll go somewhere else. Personalize the customer experience of your e-commerce site through segmentation and you will retain more customers, as well as increase their customer lifetime value. This article will discuss the different customer segmentation options marketers should know in 2019. With the rise of Big Data, we know a lot more about our customers, particularly in regards to their behavior. Using this wealth of consumer information, we can play around with more specific and focused segmentations. Customer segmentation allows you to target the right customer with the right offer at the right time. It lets you focus on the interests of distinct groupings, rather than having to address the entire audience as a whole. Customer segmentation is key to adding the level of personalization that customers have come to expect. This section will introduce three of the most popular segmentation methods, take you through why they are useful, and offer actionable ways to apply them to your business. An oldie but a goodie. 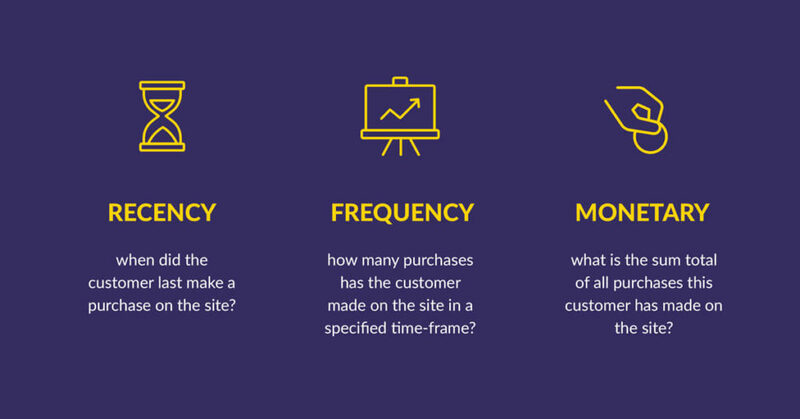 Recency, Frequency, Monetary (RFM) analysis uses recency, frequency and monetary based metrics to place customers into different stages of the Customer Lifecycle (Champion, Loyal Customer, At Risk, etc.). 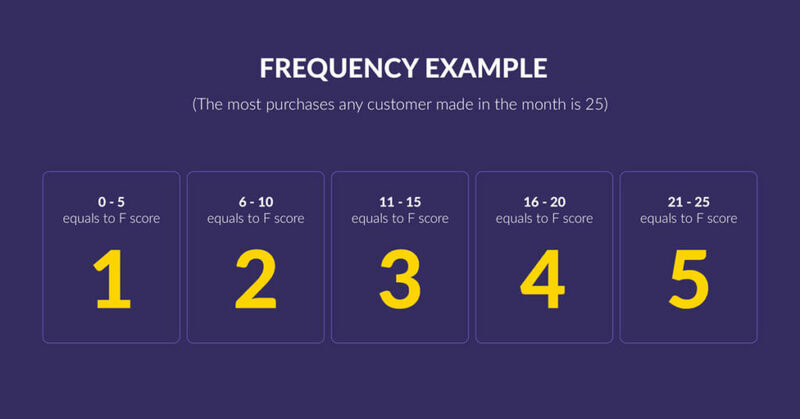 Customers are scored in in a range for each metric (generally 1 – 5), based on their data. Pick a date range. Let’s analyze the last month. Collect your RFM values for each customer. Using these values, create ranges for your segments. (for this example, we’ll use 1 – 5). At the end of the analysis, you’ll have customers with RFM scores like 425. A customer with a score of 425 has made a pretty recent purchase (R = 4), hasn’t made many purchases overall (F = 2), and has spent a great deal over the the defined period of time (M = 5). RFM segmentation can be used to predict future customer behavior. RFM is not ideal for predictions, but it’s easier to apply than more advanced predictive measures like segmentation through Machine Learning. The RFM model is also highly adaptable: Exponea uses RFM segments in conjunction with mass amounts of real-time customer data. Having pre-defined RFM categories makes it simpler for those familiar with RFM to work with Exponea’s segmentation, and the real-time data allows for in-depth predictive insights to be added. Why Use an RFM Analysis? Compared to machine learning, an RFM analysis is relatively fast and simple to perform. It can can lead to an increase in customer retention, a higher conversion rate, and additional revenue. It can also prevent churn; RFM includes segments such as “At Risk,” “Need Attention,” and “About to Sleep.” With these insights, you can prepare campaigns to directly speak with these customers and prevent them from churning. If you don’t know which customers to focus on, an RFM analysis will show you which have the highest customer lifetime value. How Can You Use an RFM Analysis? In short, a cohort analysis breaks users down into smaller groups (or cohorts) that share a characteristic (often first purchase month), and compares the data between the groups. It’s a method of spotting patterns in historical data. This is a fast, simple analysis you can perform to see how your users were affected by your decisions during each time period. Are your retention numbers higher in one of the cohorts? Why? Maybe that was the month you ran a great marketing campaign. Maybe that was when you changed the look of the homepage. A cohort analysis lets you isolate groups of data so you can understand what’s working and what isn’t. Why Use a Cohort Analysis? A cohort analysis is a fast and simple way to test your hypotheses. If you think your new banner ad is converting customers at a higher rate, you can run a quick cohort analysis: create a cohort of visitors who saw the ad, and a cohort of visitors that didn’t, then compare them. How Can You Use a Cohort Analysis? Find the bottlenecks: which stage is the hardest to convert? If you have the resources, machine learning models can deliver great results. There are two main types of machine learning tasks: supervised and unsupervised. You already know what answer you want the machine to find. Your goal is to program the path from input to the correct output. Once the machine is “trained,” you can assign similar inputs, and ideally the machine will be able to predict the output for that similar, but separate, situation. You don’t know what answer you want the machine to find. You input the data to discover which patterns the machine will find, so you can learn more about the structure of your data. In this section, we’ll focus on one of the simpler methods of supervised machine learning for enabling predictive analytics: decision trees. A decision tree works by running through a series of yes-or-no “if this, then that” scenarios. It’s useful for classifications based on historical precedent. 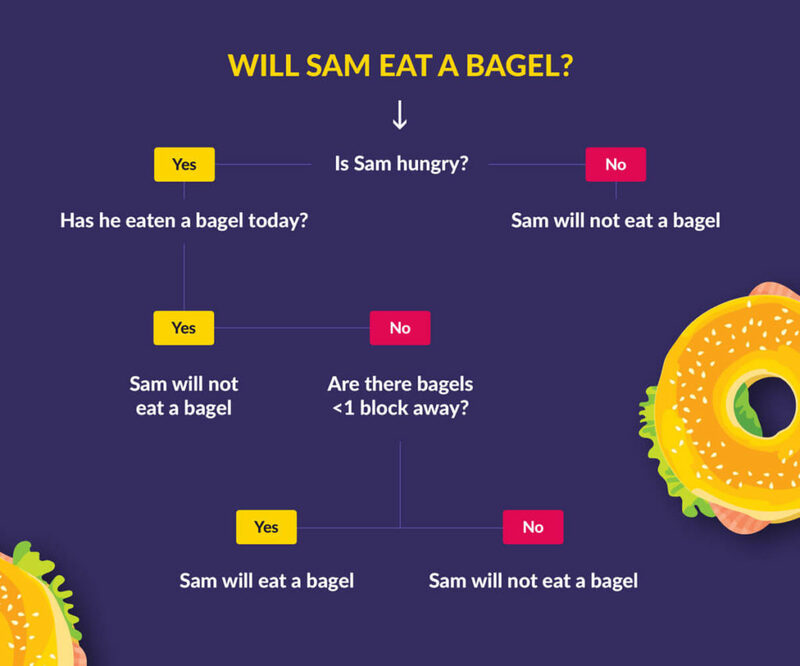 EXAMPLE: This decision tree will predict whether or not I’m about to eat a bagel. The decision trees used to predict customer behavior are much longer and more complex than this. The depth of the tree relates to how many questions there are to get to the prediction. This tree has a max depth of three, because it takes three questions to arrive at the answer that Sam will eat a bagel. Decision trees work quickly, are easy to interpret, and can be used for large data sets, but they can return erroneous results if they don’t have enough data to work from, which can even come from defining too specific of a segment. Don’t miss the forest for the trees – you can reduce errors by creating what’s known as a random forest: a group of decision trees whose results are combined to create one final result. Why Use Machine Learning for Segmentation? Machine learning enables you to take your segmentation to the next level. Machine learning segments are dynamic: they update in real-time. It makes it possible to automate your personalization tactics; something that’s necessary if you plan to deploy them at scale. Machine learning allows you to discover patterns within your data that you never would have found before, and uses them to predict how your customers will act and spend in the future. How Can You Use Machine Learning? RFM analysis is a useful strategy, but it’s also over 50 years old. Today’s customers expect omni-channel communication; their data is both richer, and more spread out. However, with a true single customer view (SCV) like Exponea’s to track your customer data, you can use RFM analysis to segment, while also utilizing advanced predictive capabilities. With the SCV updating customer data profiles in real-time, you can even craft automated strategies to span the entire customer lifecycle from Visitor to Champion. You can also use predictive analytics to enhance your campaigns. EXAMPLE: Let’s say you want to create a use case to improve your ROI by preventing customers with a high chance of purchasing already from seeing discount offers. Simply define a range for the excluded customers (chance of purchase = > 80%) and let the real-time updates take care of the rest. You can automate specific campaigns for each segment. Look at your lowest-tier segment. For us, that’s our Engaged Visitors. Your goal for this segment is to convert Engaged Visitors to the next tier up, Loyal Visitors. The only difference here is that Loyal Visitors have provided an email address. Knowing this, you can create a campaign (or campaigns) with a focus on getting that email address. This is where it gets cool. 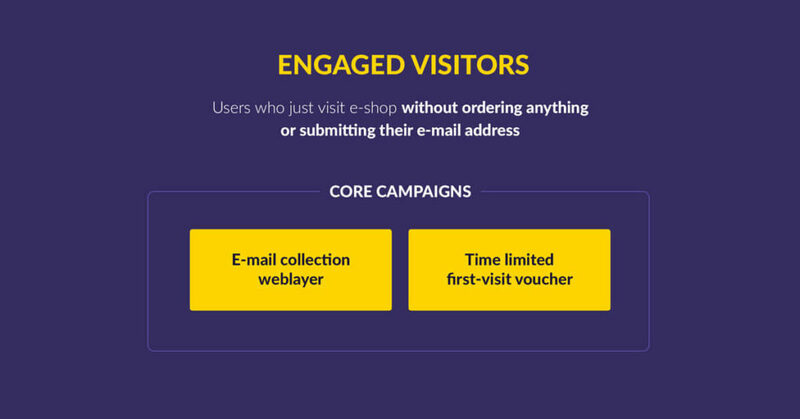 When an Engaged Visitor provides their email, the system updates their profile in real-time, and automatically upgrades them to the next tier, Loyal Visitor. 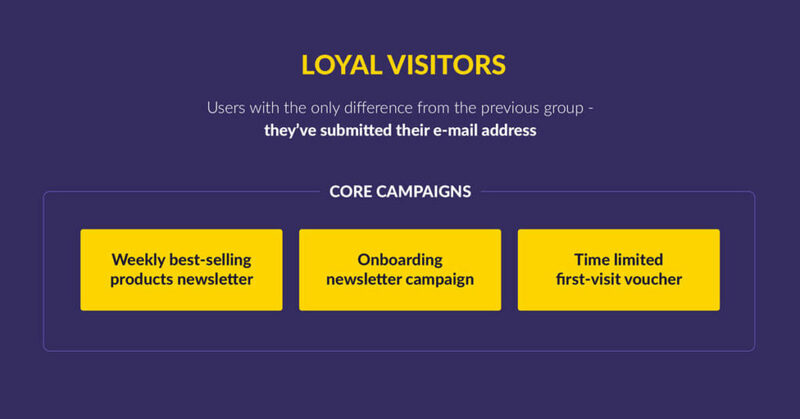 Now they receive the Loyal Visitor campaigns, which focus on converting them to the next tier up. You can see where this is going. With a true SCV and proper segmentation, you can make great strides in increasing your revenue: you have an entire system built to create more valuable customers from the bottom up. The same system can also understand when a customer is about to churn, and will begin sending them the campaigns created to retain them. You won’t have to manually update your segments as users move between them – Exponea can do it for you. Exponea uses the real-time data capabilities of their Single Customer View to add insight to the pre-defined segments of an RFM analysis, enabling predictive capabilities. With these insights, Exponea can automate campaigns to move users through the customer lifecycle from Visitor to Champion. Is your company’s segmentation as effective as it could be? Let’s find out.